I have been on a posting roll for the past couple of weeks! And I am pretty much posting only oven-related posts. In the middle of summer. Yikes. I need to fix that. But these recipes are just SO GOOD that they are worth it. 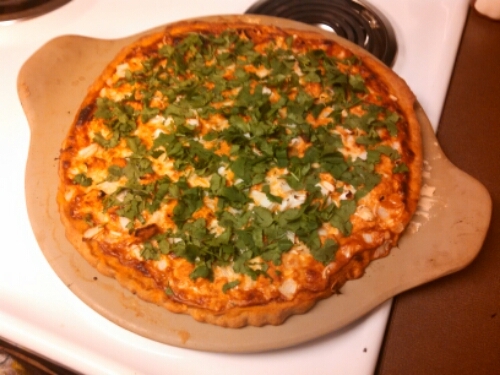 I also got to try out a new pizza crust from Trader Joe’s – their garlic and herb crust. 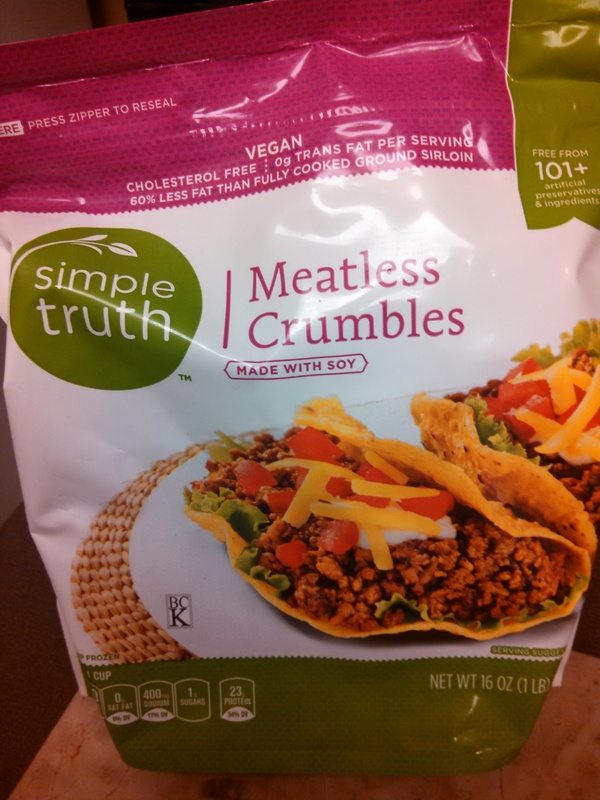 Honestly, it didn’t taste much different from whole wheat dough I usually buy from them, but it was still good and fun to try out something yummy. 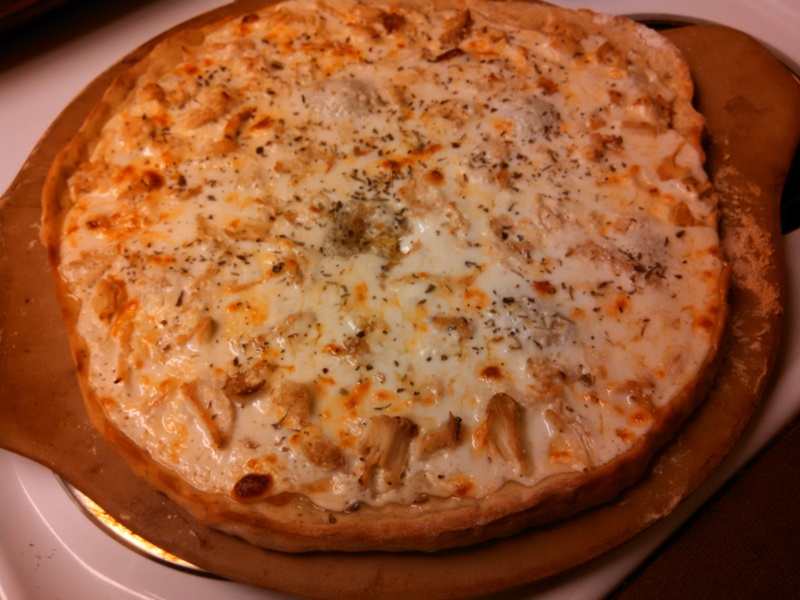 This is a chicken alfredo pizza by Foodie Misadventures. It. is. amazing. 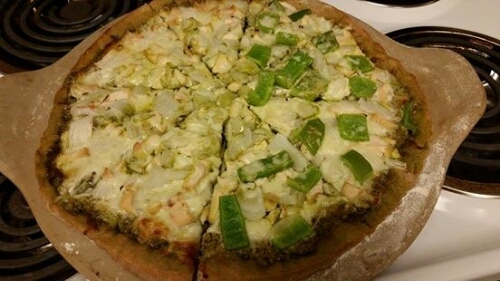 It is truly like chicken alfredo…on a pizza. Genius. 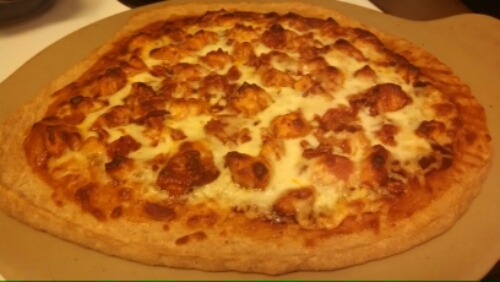 I love playing around with pizzas…buffalo chicken, tikka masala, enchilada, whatever it is, I’ll try it! I do love the traditional pepperoni pizza, but I tend to go “all out” when cooking pizza at home. This sauce would also go great with pasta, if you’d rather do that, but why not have it on pizza?? -Set a pizza stone on the bottom rack of the oven and preheat the oven to 450°. -Melt the butter in a medium saucepan over medium heat. Add garlic and cook 30 seconds, stirring constantly, then add the cream cheese; cook 1 minute until mixture is smooth, stirring constantly with a whisk. 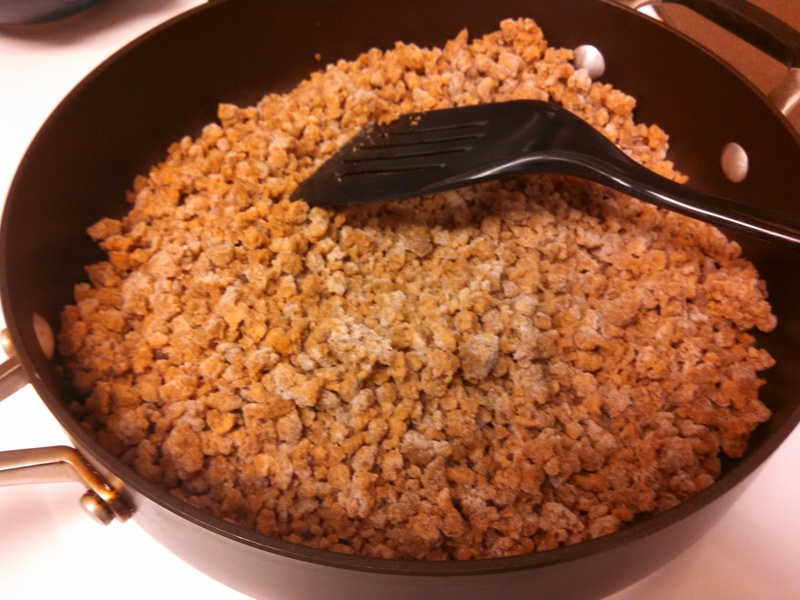 Gradually add milk and cook 3 minutes or until thick and bubbly, stirring constantly. Add Parmesan cheese, stirring until cheese melts and sauce reaches desired consistency, about 2 minutes. Add in a pinch of freshly grated nutmeg and season with salt and pepper to taste. -Stretch the pizza dough to a 12-inch round and transfer to pizza stone. 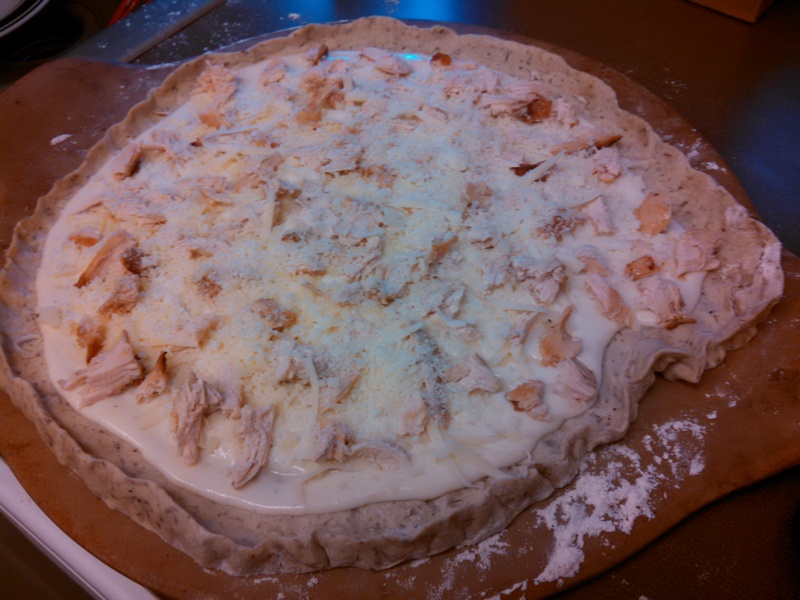 -Spread the alfredo sauce over the pizza dough, leaving a half inch border around the edge. Top with chicken, mozzarella cheese and Parmesan. -Bake for 12-15 minutes, until the bottom is crisp and the cheese is bubbling. -Let pizza cool for a minute, top with basil, then serve. I have been totally MIA lately, because I have been focusing on a new endeavor! 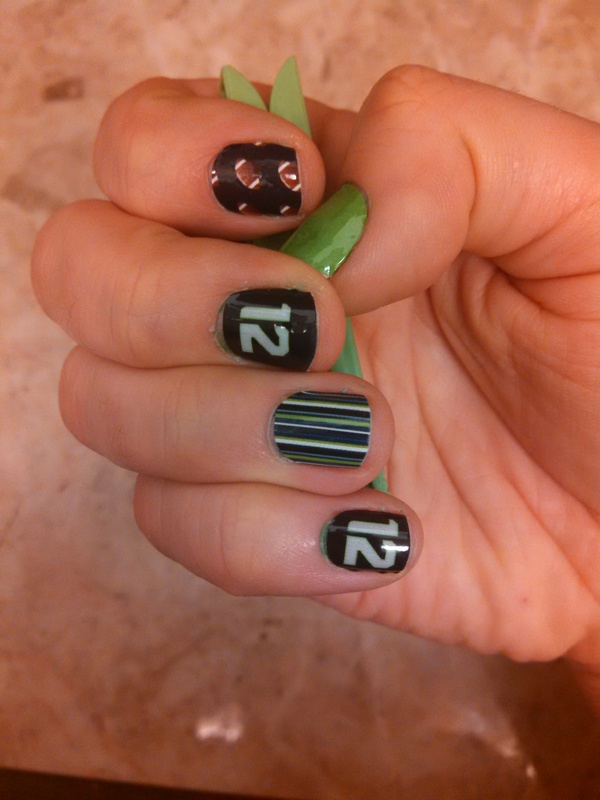 I started my own business with Jamberry Nails! 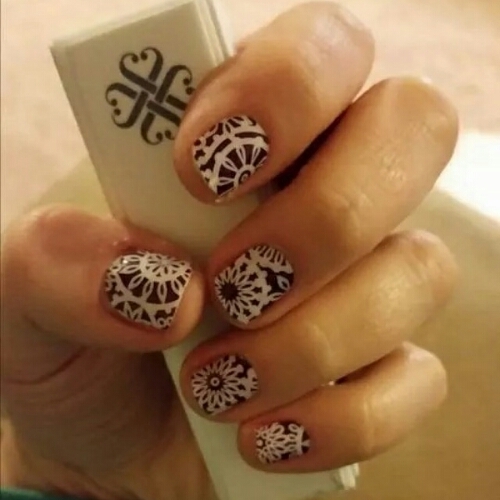 They are amazing vinyl nail wraps that are heat-activated and come in 300+ colours and styles. There are plain ones, wild ones, sparkly ones, striped ones, French manicured ones, and so forth. Feel free to click on the link above to browse online! My business name is also a play on my food blog – Never The Same Jams. The name is courtesy of my makeup guru friend Alysha. 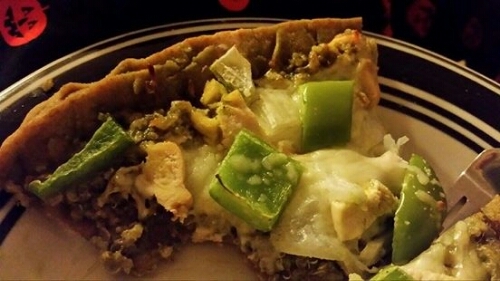 Speaking of food, I made this yummmmmmmy pesto chicken pizza from Six Sisters Stuff a few weeks ago, and I am excited to share it with you! It was so, so, so good! 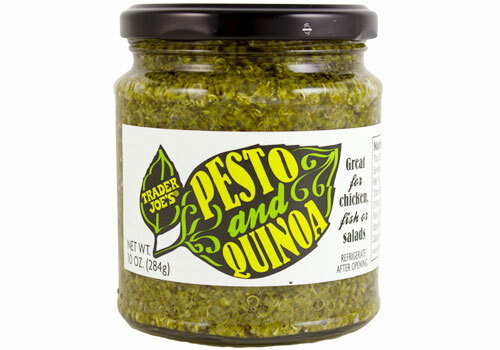 I used jarred pesto, which was actually a pesto made with quinoa from TJ’s. It was a great way to pump up normal pesto, and also made the pizza that much more filling. I actually omitted several ingredients from this pizza – like the mushrooms and tomatoes. I also put the bell pepper on my half of the pizza only (not that I ate half of it in one sitting – but I could have, it was so good!). 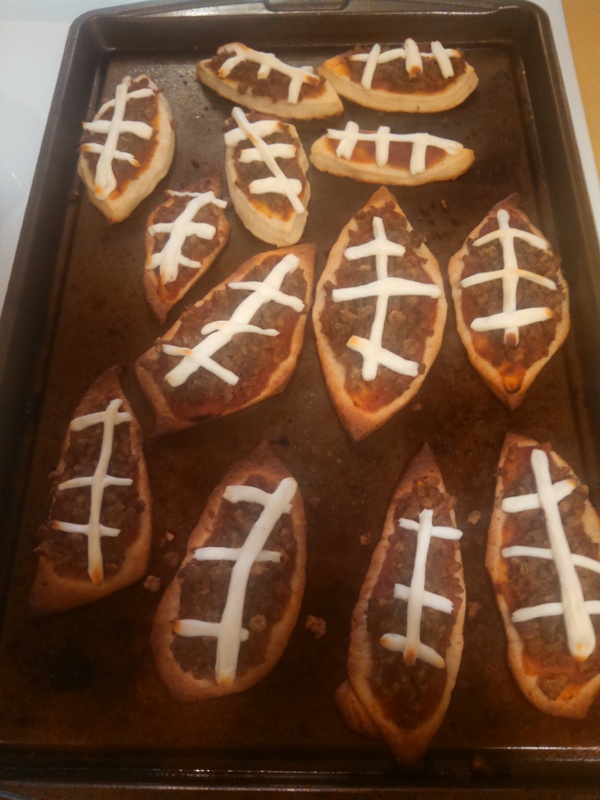 I also didn’t make my own crust, and I used my go-to whole wheat dough from TJ’s also. Whenever I’m at TJ’s, I usually buy 2-3 extra bags of dough and freeze them, so that way they are ready to go whenever I want homemade pizza, since the nearest TJ’s is about 15-20 minutes out of the way to get to. Speaking of which, TJ’s is the *only* place I can find dough in the Seattle area! When I lived in upstate New York, pizza dough was super commonplace in every single grocery store, so it was quite a shock when I moved back here. Oh well, what can ya do…Washingtonians don’t like pizza the way New Yorkers (even from upstate) do! 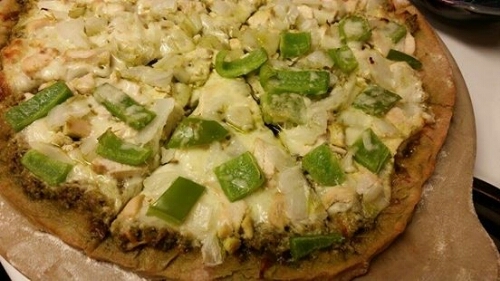 -Roll out the dough and spread the pesto over the surface of the pizza. Sprinkle the cheese over the pesto and then add on all of the other toppings. -Bake for 15-20 minutes, or until the cheese is melted and the crust is done. 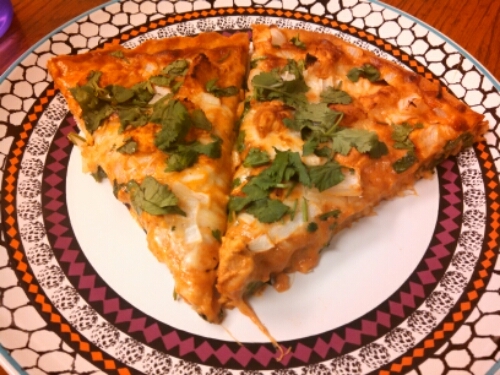 Speaking of cooking, this chicken tikka masala pizza by The Stay at Home Chef is TO DIE FOR. Seriously. Even if you don’t like Indian food (or if you don’t know if you like it), I would definitely recommend this dish. I am slowly immersing my husband into Indian cuisine, and he just loved this pizza (at least, that’s what he told me!). Personally, I am a so-so Indian food fan. Mostly, I got into it many years ago, because it was the main go-to cuisine of my dear friend Spencer. He is unable to eat it anymore, but I still enjoy it every now and again! Rich sauces, curries, tender chicken…mmmmm. I mixed up some of the spices in the sauce and chicken marinade, but it turned out just heavenly in the end. I also used whole wheat pizza dough. It was so good and so flavourful. It even tasted amazing, eaten cold the next day! 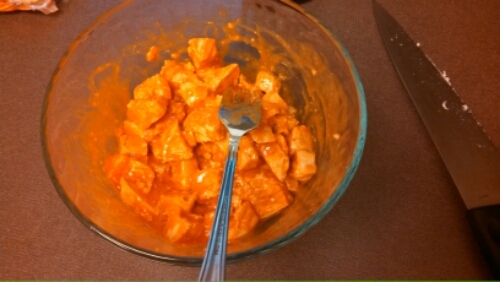 -In a small bowl, combine the chicken, yogurt, lemon juice, cumin, cayenne, cinnamon, salt, and ginger. Stir to coat the chicken evenly. -Heat a heavy skillet to medium or medium-high heat. Add in the chicken breast and cook until chicken is just cooked through, about 5 minutes (actual cooking time will depend on the size and thickness of your chicken), then set aside. -Make the sauce by melting the butter in a small saucepan. Add in the cumin, paprika, and garam masala and let it toast for 1-2 minutes. Add in the tomato sauce and salt and bring it to a simmer, then remove from heat, and add in the heavy whipping cream. -Spread the sauce over the prepared pizza crust and top with mozzarella cheese. Then add the cooked chicken and diced onion. 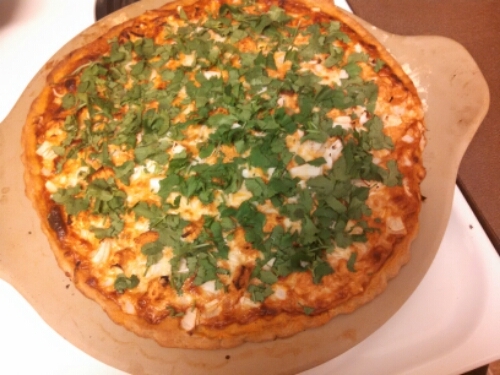 Cook in a hot oven (check your pizza dough instructions for the actual temp, as some vary) on a pizza stone until cheese is bubbly and browning, then garnish with chopped cilantro before serving. 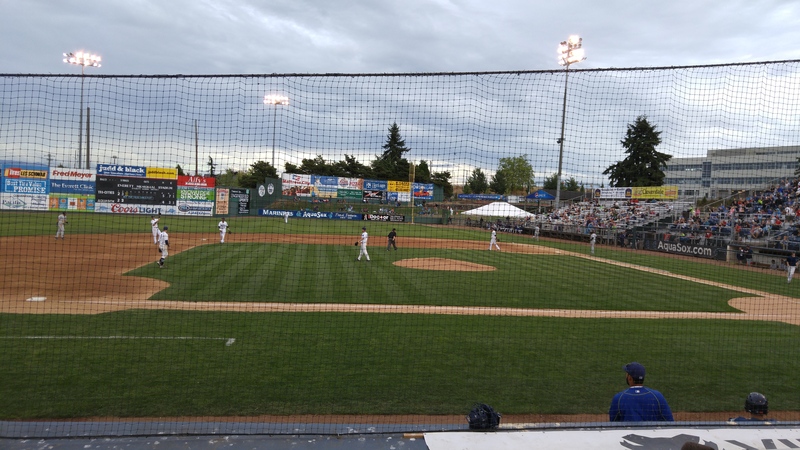 We are quickly heading into the season of chilly weather, overcast nights, rainy days…oh wait…the last part is probably more specific to my area, the Pacific Northwest! So. much. rain. But it’s what keeps everything so green and beautiful, which makes it hard to complain! I have discovered that it is almost impossible to find pizza dough around here. Trader Joe’s seems to be the only store around here that carries it – whereas when I lived in upstate New York, it was a staple at even the trashiest of grocery stores! Silly west coasters…(yes I know, I am a West Coast girl myself). 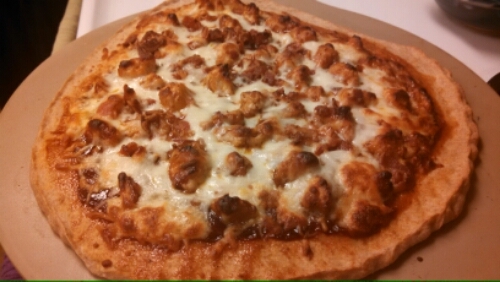 In any case, thankfully TJ’s *does* carry it, because it would have been devastating if I had been unable to make this bacon and barbecue chicken pizza by Baked by Rachel. 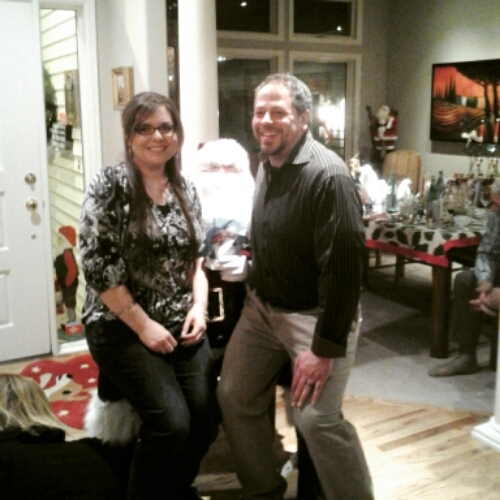 Seriously, friends – so good! -Cook bacon on medium heat until desired crispness (or follow package instructions), then set aside on a cutting board. -Shred chicken and toss with 1/3cu barbecue sauce. Also chop the bacon at this time. -Preheat oven to 425 F.
-Lightly grease a sheet pan or prepare a pizza stone and shape the dough to fit (my dough always comes out being oddly-shaped, no matter how well I try to roll it – oh well!). Spread remaining barbecue sauce as your base sauce, scatter the chicken evenly, and then top with mozzarrella and crumbled bacon. -Bake for about 10-15mins, or until desired done-ness, slice, and serve immediately! I loooooove buffalo chicken. And I especially love buffalo chicken pizza. 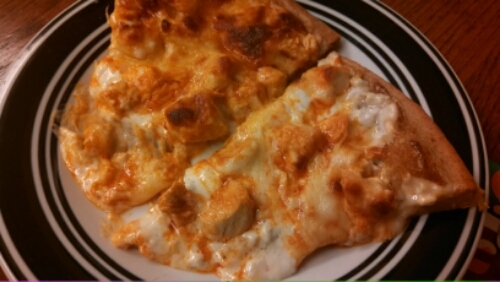 I actually have not made it very often, but my favourite pizza delivery restaurant in Albany, New York had THE BEST buffalo chicken pizza and I ordered it more than I should have. And ate in one sitting way more than I should have. I have a teeny bit more restraint now, thankfully! 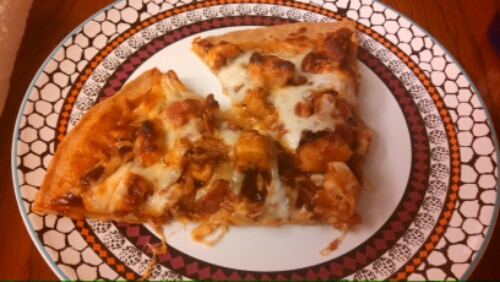 This buffalo chicken pizza recipe comes from The Kitchen is my Playground. 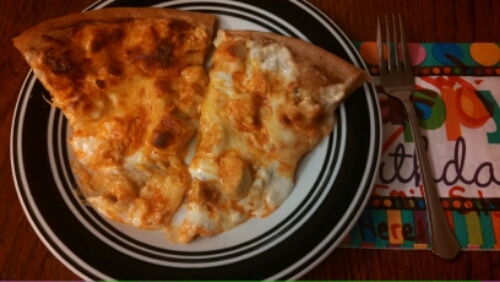 The original blogger did an interesting taste mix due to the preference of her dining partner, and she used hot sauce as the base of half the pizza and blue cheese dressing as the base for the other half. In her household, the blue cheese half won. That is what I went with as well. The pizza was SO GOOD. I have this issue with pizza though…are you supposed to pre-cook the crust or not? The instructions on the pizza dough never say, and Google has mixed results – some say yes, some say no, some say maybe, and some are really heated about it. I do not pre-cook my crust and sometimes the middle does not hold up as well as it could…but that’s also because my pizzas are typically topping-heavy…but so are the blogs I follow! So it’s a conundrum. For someone who is not a stranger to homemade pizza, it’s funny that I have this question. I guess I could just do my OWN experiment. As an aside, some people are not huge fans of the bite that blue cheese dressing can have, so you can easily substitute Ranch dressing if you would like. It changes the flavour a bit, but as long as you still have the buffalo sauce, it still counts! -Heat olive oil in a saute pan and saute chicken until cooked through. -While chicken is cooking, melt butter and combine with the Frank’s Red Hot sauce in a medium-sized bowl. Once chicken is cooked through, combine it with the sauce mixture, and toss to coat the chicken well. -Marinate the chicken for about 15 minutes. -While chicken is marinating, prepare your pizza crust. Roll pizza dough out to desired size and place on pizza stone or baking sheet. 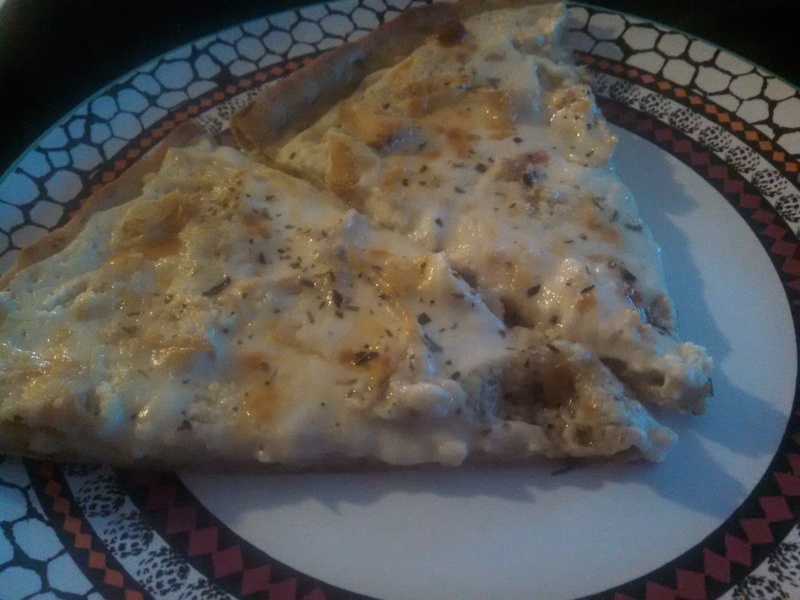 Smooth out a layer of blue cheese dressing over the crust for sauce, top with marinated chicken, then sprinkle generously with mozzarella cheese. -Bake at 425 degrees for about 20-25 minutes, or until crust is cooked through and the cheese is bubbly and beginning to get golden brown (FYI – my baking time was about 18-20mins, but it really varies on your oven! ).